A family event featuring an Easter Egg hunt of over 20,000 eggs and giveaway prizes! We're taking a group of high school students to help Waterfront Church help with this event. For more information, click here. Kurt Kiser will be our speaker. $5 lunch provided by Fuddrucker's. Catered lunch at $5 per person. Former NFL players, Guy & John Earle, will be our speakers this month. We meet in the Connection Center. Senior Adults monthly lunch that includes a catered lunch, music, and encouraging word. To RSVP, please call the church office at 806-698-6553. Join us during both morning worship services as we dedicate the new year by taking the Lord's Supper as a family! Fuddrucker's will be catering a meal for $5. Corbin Young, Tech Men's FCA Coordinator will be our speaker. Christmas Program - "Peace on Earth"
October 1st at 6P is MOVIE NIGHT! We will be watching The Case for Christ in the Connection Center and we will have a popcorn bar with lots of tasty toppings! Sunday, September 17 is Vgroup Community Night. A night where we get together in our VGroups and p-a-r-t-y! Lots of fun and fellowship. If you don't have a group and would like to join the fun, a list of groups and their activities can be found at the Guest Services desk in the lobby. Bunco is coming up on September 12th from 6:00p - 8:30p in the Connection Center! 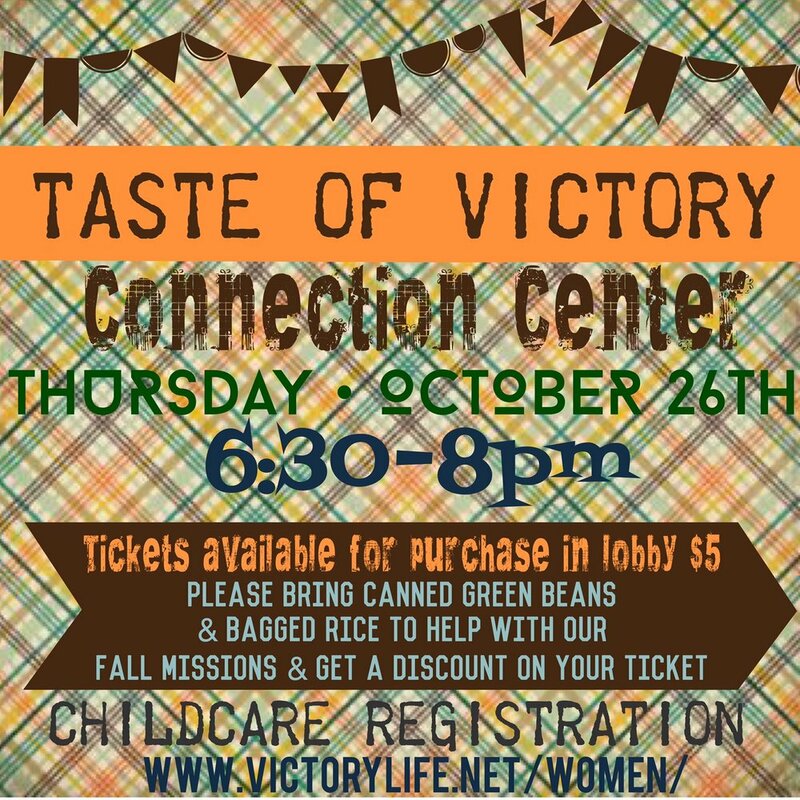 Ladies, please bring canned vegetables for the blessing tree, a potluck dish and a friend! Join the VKids for Explorer's Camp this summer at Plains Baptist Assembly in Floydata. We will have an incredible experience worshipping together, playing together and growing in our faith. VGroup Community Night is coming up next Sunday, June 25th! If you'd like more information about our VGroups, you can visit the Guest Services desk on Sunday or send an email to vgroups@victorylife.net.